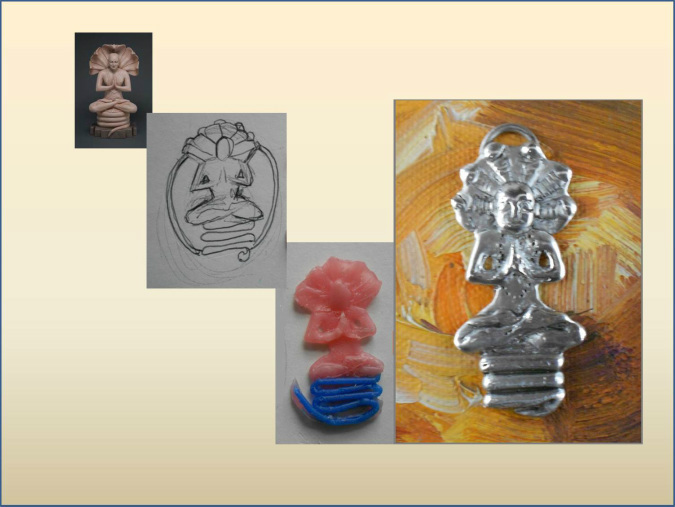 As a specialty boutique we design-mold-cast-produce unique & exquisite images in silver and bronze for pendants, rings, ear rings and other artwork using a process called the Lost Wax Casting. The Lost Wax process is probably the oldest method of casting metal. It dates to about 3000 B.C. A model of a design, with all its details, is made in wax. Tubes, also made of wax, serve as channels for pouring the metal during casting. The wax model gets completely covered with layers of heat resistant plaster. The plaster-covered mold is then put into an kiln. During heating, the wax melts, thereby becoming "lost.” It pours out of the channels that have been left in the plaster by the wax tubes. The impression of the original sculpture remains. The metal (brass, gold, silver, etc.) is heated to a molten state then poured into the channels, filling the space left by the wax. It takes the form of the original wax model. When the metal cools, the plaster is removed and the piece is then cleaned, smoothed, buffed, and polished. Among the benefits of the lost wax process is that small, precise details are beautifully preserved. For this reason, the process is used to make jewelry, dental pieces such as crowns, and precise industrial instruments. Below are photographs documenting the metal casting process.